Our Bodacious Dog Mom Life: Thank You To Martha, Brian, And All Of Their Furry Babies! Thank You To Martha, Brian, And All Of Their Furry Babies! 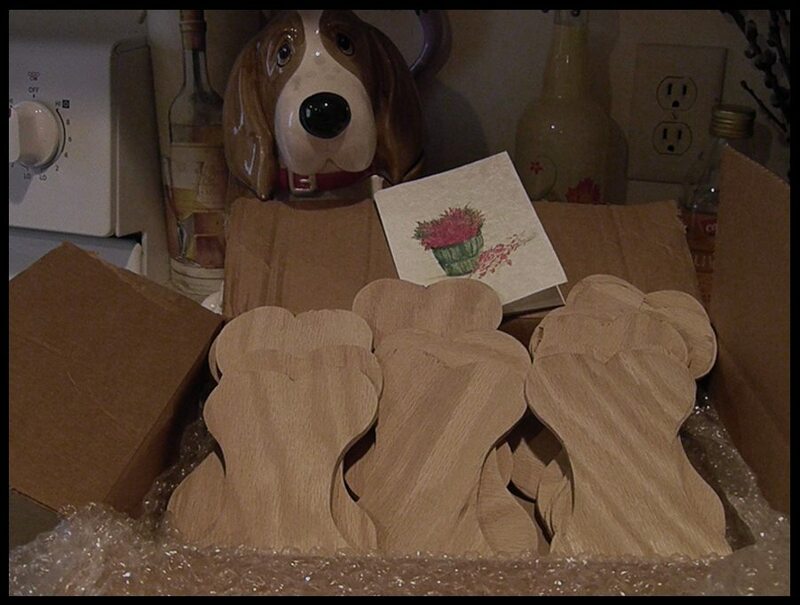 Today we received a box of hand-cut wooden bones from our friends Martha, Brian and their furry babies. I was so excited to receive these. Months ago I had put out a plea for hand-cut wood bones in this size and a gigantic one. Martha and Brian didn't waste any time. They purchased the wood and Brian worked hard to cut the bones. Since then, we've tried to meet up several times to pick up the wooden bones, but they live almost 2 hours away. Between everyone's schedule, it's been tough. Martha decided to mail the smaller bones. I'm anxious to use them for some upcoming DIY Dog Mom Projects including a batch of holiday signs. I'm also itchin' to get Lisa's wood shop put together downstairs in the basement. Towards the end of the summer, we had a quickie yard sale to get rid of the stuff we had in the basement. What we didn't sell, we donated to the Salvation Army. We had a few vintage pieces and antiques. Our neighbor friend Bob took those to sell. The whole point of clearing the basement was to give Lisa more space for her wood shop. Because seriously, I did not want to host a yard sale. Those days are done and over with. Throughout the year, Lisa has bought some power tools and a Bob gave Lisa a stand saw for her shop. She's got a decent amount to start off with. Now, it's just a matter of leveling the work table, getting it sanded and painted, maybe adding a few shelves, and her putting things where she wants them. Now, all we need is time. Our weekends have been so busy as of late. Lisa has spent quite a bit of time outside getting wood pieces cut and sanded. However, with it being the middle of October, there's not going to be too much outdoor work time left especially if we get pounded with snow and below freezing temperatures. Our goal is to have her wood shop set up by the end of November. Fingers crossed. It's a lot of work to do especially during the busiest time of the year, but I know we can do it. Stay tuned! I'll be posting pictures as Lisa's woodshop comes to life.